Posted On November 29, 2014 by Team iCynosure. Most of you must know my fixation for cream-based products as opposed to powder products. The one product that I’ve used since it was launched is the cream blush by Oriflame. You can read my review about it here, and you shall know how much I loved it. So it isn’t a surprise to me that my current favourite cream product is another gem from Oriflame as well. My favourite brand has launched the Colour Impact Cream Eye Shadow as part of its #TheOne range. Since the review products arrived in November, I’ve been testing them continuously, as I simply cannot get enough of them. Here's a quick review of the newest ‘It Beauty Product’ of the season. What is Oriflame’s Colour Impact Cream Eye Shadow all about? 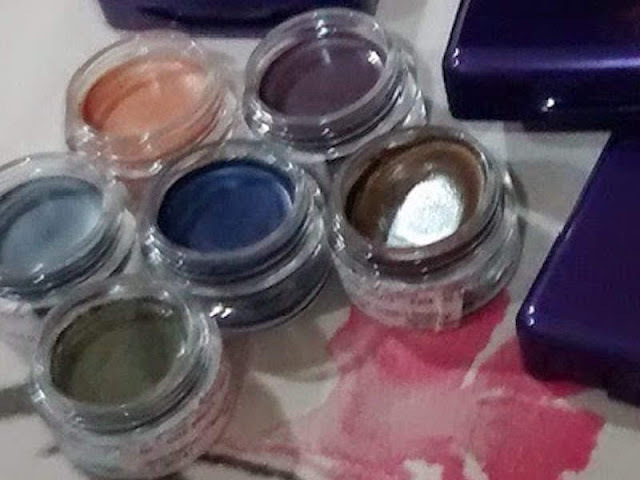 The product is a one of a kind cream based eye shadow available in the Indian beauty scene. The product claims to be a cream textured eye shadow that spreads evenly when applied with your fingertips. The product is suitable for all skin types as it uses the body heat to blends perfectly.The creaminess will reflect in a natural glow without any dryness of a powder product. Colour Impact Cream Eye Shadow all about? Ingredients include Dimethicone, Mica, Calcium Carbonate, Propylheptyl Caprylate, Nylon-12, Synthetic Fluorphlogopite, Zea Mays Starch, Candelilla Cera, Hydrogenated Castor Oil, Stearyl/Ppg-3 Myristyl Ether Dimer Dilinoleate, Alumina, Octyldodecyl Lanolate, Polysilicone-6, Propylparaben, Tin Oxide, Tocopherol, Ci 77891, Ci 77499, Ci 77491, Ci 77007, Ci 77492, Ci 77510, Ci 16035. The richness of the product is felt instantly. The product is available in six festive shades; Rose Gold, Shimmering Steel, Intense Plum, Deep Indigo, Olive Green, Golden Brown. Each colour is gorgeous and must be tried. The cream blush is provided in a super cute transparent pot with a screw-on cap. It is priced at INR 449 for 4g with a launch offer price of INR 299. The product is worth every penny spent. The one thing that stands out in my experience of using the eye shadow from #TheOne range is that it stays. The creamy texture allows you to blend the product perfectly onto your eyelids with your fingertips and you can change the intensity of the look in a few seconds. The eye shadow does have a bit of a shimmery effect that some may assume as shiny but as you play with the application you can achieve the look you prefer. An important aspect I chalked out after a few trials and errors to find a perfect process that helps me with my eye shadow look. I first use a primer on my eyelids followed by a moisturiser and a concealer and finally the cream eye shadow to attain the perfect look that doesn’t need correction or touch-up for the entire day. Depending on the time of the day I alternate between a subtle and a more intense look. The One Colour Impact Cream Eye Shadow is a product that could be worn every day. To know more about Oriflame’s #TheOne range of products and to join their Facebook page click here. Would you like to try the Colour Impact Cream Eye Shadow? Leave me your comments.